2018 was undoubtedly the year I upped the ante with my skincare game. Like, I actually recognise the names of pure scientific ingredients these days - AND what their role is in bettering my skin. PLUS I now know how to pronounce a whole load of words / brands properly [An-ti-po-dese not anti-podes] and don't just wing it like some pyar novice. I wanted to write a lil feature dedicated to some of the brands & products I loved the very most in 2018's skincare path of discovery - which leads us to where we are today. Wayyy later than I'd planned and probs wayyy rambly due to the amount of coffee I've guzzled today; but hey. Let's begin this mad ode / profession of love / fit of weeping over my fav skincare, hey? 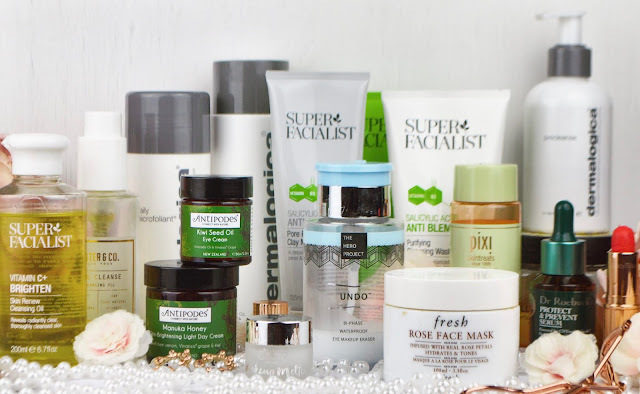 Let's kick off this huge wave of skincare appreciation with a couple of the brands that have really revolutionised my face this year; Super Facialist and Dermalogica. Oh my daysssss. Their products smell amazing - so relaxing and fresh. Their Salicylic Acid Clay Mask works legit miracles on my oily AF [giant] face and their cleansers are rly gentle & fresh - yet effective. This Vitamin C+ Brightening Skin Cleansing Oil smells like all the oranges and it's a fruity dream for skin. Without contributing to the mass oil production / slick / population that hangs out on me fod. Dermalogica are a more high-end brand I wouldn't typically be able to afford. Luckily though, they've spoilt me these past 12 months as part of their #Skinfluencer program - & getting this access to their products has educated me on just how bloody brilliant they are. I use their Pre-Cleanser, Cleanser and Microexfoliant religiously and I'd say if you have problem skin, it's definitely worth investing in their products. I see a lot of people singing this brands' praises - with top beauticians using their range in their salons and celebs raving about them too, and I can totally see why. This teensy Ciaté Makeup Melter was a sample I got in my Ciaté 12 Days of Christmas Advent Calendar last year - yes it's a tiny sample size & close to running out, but it's bloody brilliant and 100% deserves a mention. It literally does exactly as its name suggests; melting even the most stubborn swatches off the back of my hand - and the mascara right off my lashes. It's a cheaper alternative to some of the high-end makeup removing balms & I'm all for it tbh. 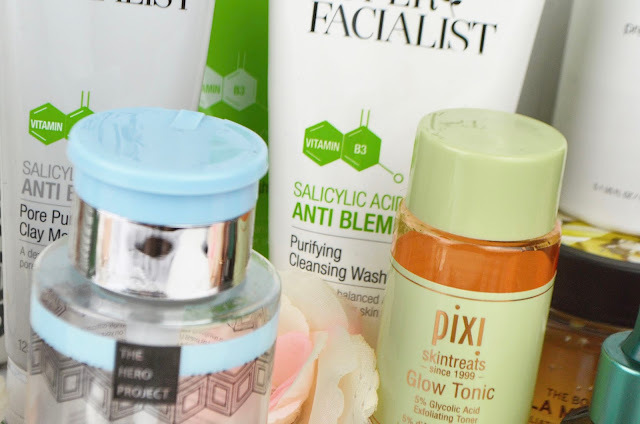 I don't think any ode to skincare would be complete without the inclusion of Pixi's Glow Tonic. It's that cult product that everyone raves about - and for good reason. I was lucky enough to be introduced to Fresh skincare by my lovely huns over at World Duty Free Beauty. They sent me the most BEAUTIFUL hamper of Fresh goodies ever, and I went from being totally unfamiliar with the brand to falling deeply in love with them. Their Soy Face Cleanser was probably one of my favourite cleansers of all time [sadly it ran out a long time ago, due to my obsession with it] and if I ever want a truly luxurious, relaxing night of masking, I always reach for this Rose Face Mask from them. The smell, the formula, how gentle it is on the skin & the stunning packaging make for such a lux experience. Next up is another empty unfortunately [*sobs*] - but let's take a hot minute to appreciate Dr Roebuck's bangin' range in this post. Again another fairly high-end brand, the Dr's selection of serums are just amazing. I swear by this Protect and Prevent Serum to keep my skin clear - and I love how fresh & non-greasy their Pure moisturiser leaves my skin. It's light enough to use pre-makeup, with no weird consistency & streaking when product is mixed on top of it, and I just love it. This Sister & Co Cleansing Oil [another empty 😥] was the first cleansing oil I ever tried. I'd always shied away from using oils to cleanse my already oily AF face in the past; as I thought it'd just exacerbate the problem more - but this was not a factual assumption. Bloody hell, wot is this - I've admitted to being wrong twice in one post here...?! It's rich and luxurious on the skin, lifting away makeup so gently with a cotton pad - and leaving your face feeling ded loved & nourished afterwards; not a bit raw and stingy like cheap makeup removing wipes can. Without making me more oily. I now fully leap at the chance of trying cleansing oils; thanks to the faith this product gave me. I don't mean to be dramatic [hahaha, no I take it back - I totally do] but this is the best eye makeup remover in the world. This Undo Waterproof Eye Makeup Eraser from The Hero Project is legit bae when it comes to removing all scraps of mascara & eyelash glue. I went to a Body Shop blogging event at Christmas, where I picked up this Vanilla Marshmallow Exfoliating Sugar Body Scrub from their seasonal collection... and fell heavily in love. The smell is what got me the most at first - it's so nice it makes me wanna weep and also eat it [but I haven't, and would strongly advise against this act]... but its effectiveness, formula & feel on the skin has actually got me weak. With this being a seasonal fragrance I suspect it's no longer available to buy, but I'll one million percent be tracking down more of their alternative sugar scrubs to plaster all over my person. Last but by no means whatsoever least I just need to weep over and profess my undying love for all things Antipodes. This organic, vegan skincare brand makes me so happy - their products are so beautifully fragranced, gentle, effective & luxury; in iconic packaging that totally dresses up my bathroom. This Eye Cream, Day Cream and their Toner are probably some of my favourite pics from the goodies I have - OH and their Cleansing Balm too. But I'm not going to ramble on too much at this point; as I have more detailed content on these products coming soon & by now, this post is probs about 3000 words long. And there we have it - about 3 hours later, I've finally managed to get through my Standout Skincare 2018 picks! Have you tried any of them before? *This post contains some products I was gifted during 2018 and have already written about / disclosed as part of my work with that brand or agency. Featuring them in this post was entirely my choice, as I love them, and not something I was asked to do. Others were bought with my own money.